Australia is beginning to feel like home more and more each passing day. Living in the moment is so easy here, and I’m in a constant state of euphoria. Now that I’ve been in classes for a while, I have a more structured routine for my day-to-day life. I’m enrolled in two courses that will contribute to the progress of my major (political science) and two that will contribute to my minor. I’ve found friends to go running with on a path near campus, and there’s always the option to run along the beach. Being able to run outside is an amazing comparison to having to do it inside 8 months out of the year (one of the many pros of ND). Being this far away from home definitely gives you an enhanced sense of independence. MADISON HAPKA | THE SPECTRUM Sunlight highlights shipwrecks on Moreton Island. Home to reefs and a plethora of sea creatures. I attended a tour to Moreton Island (the third largest sand island in the world). The travel consisted of a bus to Brisbane, and from there I took a ferry to the island. Moreton has this incredibly crystal clear, teal colored water. The first day we spent mostly sightseeing, with the exception of swimming in a blue lagoon. The tour guide brought us to a variety of lookouts including Gnoorganbin, the one overlooking Braydon Beach (my personal favorite) where we had to hike a short distance to get to the top. We also went to a Cape Moreton Conservation Park, where we walked up to the lighthouse and enjoyed yet another breathtaking view. We finished the tour with Honeymoon Bay and Champagne rocks, which included a small rock waterfall as a result of the tide rushing in. After getting settled into our accommodation, we took the bus back to the main beach for night kayaking. We were split up into three groups and given these transparent kayaks that lit up with LED lights. I had never even heard of this before coming here, but it was easily one of the best hours of my life. Moreton island has a series of shipwrecks, and underneath lies coral reefs filled with marine life. We saw a large sea turtle, a small shark, a stingray and some fish. I would highly recommend this if you ever get the chance. During day two of Moreton, we went day kayaking (no, it doesn’t compare to the night) and snorkeling. We had to wear these ridiculous wetsuits for protection from the shipwrecks, but it was a blast. We saw multiple kinds of colorful fish and coral, as well as a yellow shark hiding in one of the reef holes. To finish off the weekend, we headed to “the desert” for sand boarding. Sledding in ND is fun and all, but it definitely can’t top this. We hiked to the top of this huge sand hill, and the view from up there was a lot more intense than what we expected. Although the first time was a little bit scary, the next three were so much fun. Moreton island was my favorite trip in Aussie-land so far, but I also enjoy the local opportunities as well. 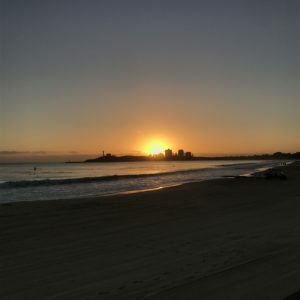 I’m fortunate to live on the Sunshine Coast because my apartment on campus is only about a 15-minute car ride from the beach. So you can imagine how much time I spend there. 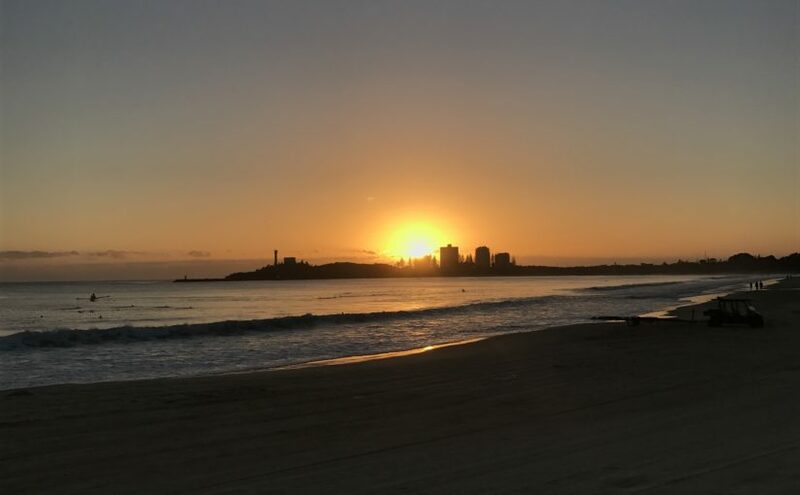 Mooloolaba beach is the current local favorite, and a few days ago, I woke up at 4 AM to watch the sunrise there. The sunrises are captivating, and I couldn’t think of a better way to start my day. I also attended a local market this past weekend with a group of friends, and I tried surfing as well. Typically when you’re learning to surf you start with a board about 9-10 ft. long, but we thought it would be a good idea to start with 5-6 ft. boards, and I’ll just say that next time we’re going to rent appropriately sized boards. Although I didn’t get the complete hang of it the first day, I stood up for a couple seconds and got the feel for it (plus, wiping out for hours is surprisingly entertaining). Now that I’ve tried surfing, I see why people are so dedicated to it. It’s a very popular hobby here, and I’m eager to keep learning. Each time I take the opportunity to explore new Australian territory, I get more attached.